The Time that Jerk Bear Ate a Part of my Truck. 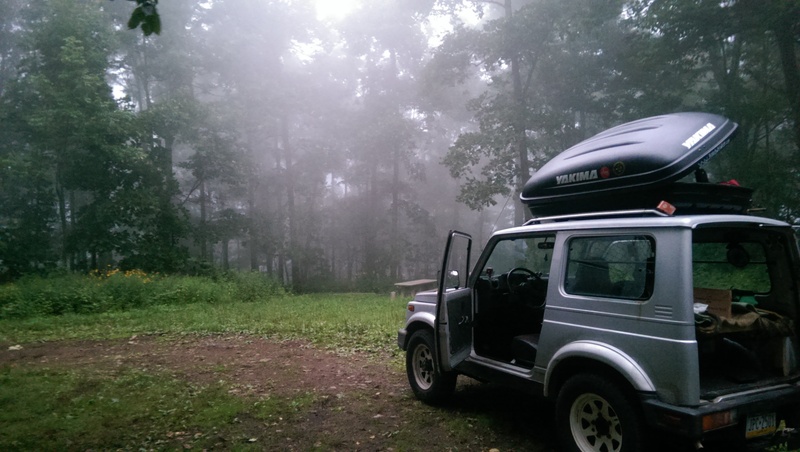 We were camping in Tennessee along a forest service route near South Holsten lake. At an overgrown camp site called Low Gap. The drive itself was a long and windey climb up to the ridge, the road was pretty rough in most parts. There was a grave near the top as well, NOTHING OMINOUS THOUGH. We set up camp on a nice little grassy hill, there weren’t any other campers, probably because nobody has ever heard of this place (including local forestry service workers I talked to later) or because it was the beginning of the week. Either way it was just us at the top. We let the dogs run wild, and made ourselves dinner and pitched camp. I got to work taking some photos, the area was pretty neat and you could tell we were fairly high on a ridge through the trees. The sun was setting, and you could see a cloud starting to creep through the trees, it honestly looked like something from the movie “the mist” STILL NOTHING OMINOUS THOUGH. The fog hit us pretty hard and it was soon hard to see more than a few feet in front of us. Also we were pelted with heavy winds and random gusts of rain with it, which killed our fire while we were trying to put all of our stuff back into the truck. We decided to pack it in and call it a night fairly early, and went in to read. The pups quickly fell asleep on our feet. Around 9pm I heard some rustling outside. I stopped reading and waited and listened. Our ever Vigilent watch-dogs were passed out asleep. I heard the noise again, and turned on my headlamp, only to see a rather large black bear tugging at something on the back of my truck, not 5 feet from us. We shall call this black bear “Noodle” Its actually quite amazing how quiet something so large can be, particularly since our dogs cant even run through the woods without tripping on their own legs and falling face first into a tree stump. At this point Noodle and I made eye contact, and I started yelling a series of profanities at him. That is when I watched Noodle panic, grab a hold of my mud flap, and run off with it like a gigantic jerk. Noodle is a jerk. I hope that mud flap tasted like a chunk of plastic, Noodle; BECAUSE ITS NOT EDIBLE, EVEN FOR BEARS. So we decided the best idea would be to pack up camp and move, we have two dogs with us and this bear was particularly brazen to approach us at that point. Not worth the risk of having more car parts stolen. I wasn’t trying to wake up to my truck on cinder blocks. And it wasn’t worth the risk to us or the dogs. Or our supply of food. We sleepily threw everything into the Samurai, and headed out. Only after I pee’d on the campsite so Noodle would forever remember me. Well that quickly went sour as we realized that we were still in a thick fog, and that the roads were near undrivable at night, let alone coated in an extra blinding layer. We kept following the service road hoping it would lead us to anything, but were let down when it dead ended about a mile from the camp. So we doubled back and crept back along the way we came. We honestly didn’t get very far. We decided it was much too dangerous to keep driving and attemped to sleep in the car. Now you may know that Suzuki Samurai are not known for being rather large vehicles. Especially if they are modded to fit two grown human beings and two dogs, along with equipment. We essentially did not sleep. So here we are today at Warriors Path state park in tennessee, we decided to cheat and jump forward a few miles on real roads in order for us to quickly find a place to sleep. 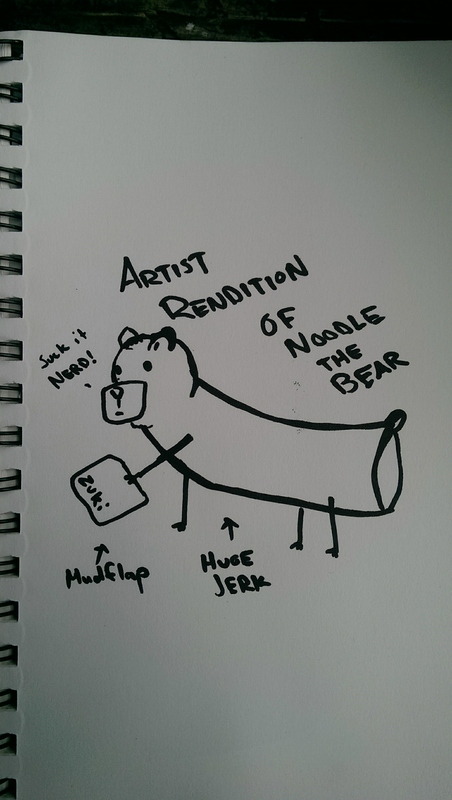 Sometimes black bears named Noodle, crash your party. Because thats what jerks do. Hahah this was hilarious. Especially the drawing you created. Hope the future awaits some more hilarious (but safe) stories! In the mean time,Noodle seems a great name for a jerk of a bear,LOL,I’m glad he/she wasn’t more aggressive and you guys (all 4 of ya’s) came out of it only missing a mud flap and some sleep rather than worse. That’s a bummer! Yea, we weren’t really planning on being at warriors path at all. But, after “sleeping” in the car we had to find a place to rest for the day.